Continuing the chronological sequence of Paul's letters means that this month it's I Corinthians, which - in Chapter 13 - contains what has to be one of the best-known, best-loved, most-used pieces of scripture ever. A real gift to anyone looking for a lovely sentence or two to quote! Yes, it would have been dead easy to use a quote from that chapter, but also too easy, too obvious. There are 16 chapters in I Corinthians - surely there must be some nuggets to be found in the other fifteen? So I have read my way through all sorts of directions concerning marriage and non-marriage; through various diatribes and tellings-off, as well as our earliest account of the institution of the Eucharist. And I have to say, Chapter 13 was definitely where Paul surpassed himself! Maybe he needed to get all the other stuff out of his system before he could relax and get lyrical about love. ... But this is Lent, a time for looking temptation especially squarely in the eye... And it's springtime here in the northern hemisphere, and surely no coincidence that this is when many of us do what we call "spring cleaning". Because Lent is a time for cleansing and de-cluttering; for tidying our lives and putting different aspects in their right place - not as an end in itself, but as a means to an end, which is greater union with God. It's a time for focusing on our deepest desires for God's centrality in our lives, and for trying especially to rid ourselves of some of those false gods we manage to accumulate as easily as all the extra dust and clutter we sweep out of our rooms. I was talking with someone the other day who said this Lent she was aiming to be "free from...(XYZ)", in order to be "free for... (God)", which kind of sums it up. And for me this month's quote follows on from that, puts the false gods in their place and reminds us, simply, of who and what God is. And this month's topical photo just had to be of a lamb! This month is when we would normally see them gambolling on hillsides and looking so beautifully cute and woolly. This little fellow came from Brecon in Wales, and seemed happy enough to pose cheekily for a photo! 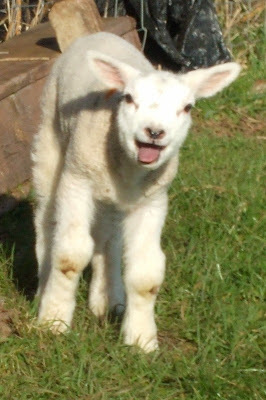 Sadly, at the moment, thanks to the Schmallenberg virus, lambs are in the news for the wrong reason, which means that any we do see gambolling, frisking and posing for our cameras will be an even more precious sight.